This week has been my most productive in terms of shear gameplay in months. I honestly feel quite accomplished. It took me a full week later than planned to wrap up Final Fantasy IX, but I finally did that this past weekend. Meanwhile in the three days since starting Final Fantasy X I have progressed nearly 8 hours, which is pretty dang good if you’re familiar with my current schedule. Sadly I’ll have next to no time to play for the next three days, so I’m glad I was able to get such a solid start. Anyway, I’ve got a LOT to say this week, so let’s get right to it, starting with my closing thoughts on Final Fantasy IX. I finished the story of Final Fantasy IX on Day 241: August 29, 2015. 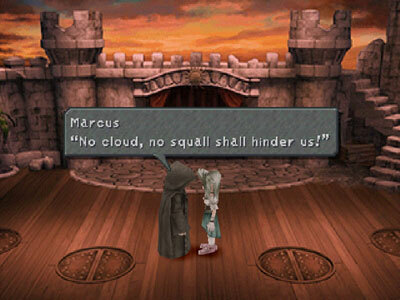 I know I’ve already discussed many, many throwbacks present in Final Fantasy IX, but I have to make special mention for two final particular nods that caught my eye. 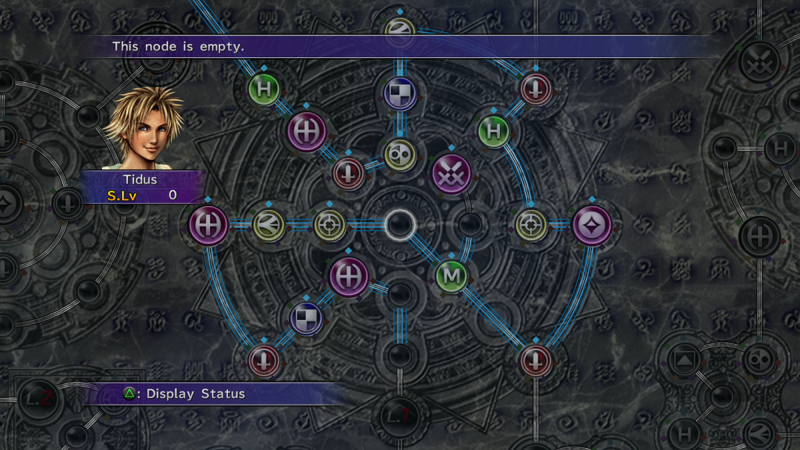 First, on the lead-up to my final confrontation with Kuja, I fought several mini-bosses; four of them, to be exact. Their names are Maliris (Marilith), Lich, Kraken, and Tiamat. Sound familiar? Those four guardians are actually the monsters that protect the four crystals in the original Final Fantasy. It amazed me to see them pop up right near the end of the game, when I thought surely there would be no more opportunity for any more references. It was great experiencing those battles anew. Of course, the final nod was one that I can’t believe I didn’t catch (or remember) from the first time I completed FFIX, as it is so simple, eloquent, and perfect. Following the final battles, the epilogue scenes show a reprise of the opening play, “I Want to be Your Canary”. The hero goes into a monologue on-stage, and directly shouts out the names of Final Fantasy VII and Final Fantasy VIII’s protagonists. It was a lovely way of paying homage to the PlayStation trilogy as the final one came to a close. Speaking of the ending, I’ve got a bit of beef to nitpick regarding it. Following the final battles and a fade to black, a few words appear on the screen saying, “Some time later…” We get to see a bit of “Where are they now?” for all the main characters, which is nice. Eiko adopts Cid and Hilda as her father and mother, Quina becomes head chef at Alexandria Castle, Steiner and Beatrix finally confess their feelings to each other, and Vivi has a bundle of children. Wait, say what? Why? How? When?? You don’t explicitly see Vivi in the end-game; just five or six black mages who look and dress like Vivi, claiming to be his kids. They look just as old as Vivi was throughout the entire game, yet Eiko still looks like a six-year old. Prince Puck is still a pipsqueak, and actively confused one of the mages for Vivi at first. Zidane’s hair is the same length and style. Beatrix, Steiner, Freya, and Amarant all look exactly the same too. The only character who looks at all different is Garnet, whose freshly chopped hair is back to its full length. This indicates that “some time later” is at least a year or so, because most hair doesn’t grow that fast. So when exactly did Vivi have time to father so many kids? Did he meet a lady mage? Did he just find a bunch of young mages that Kuja created and take them under his wing? No more artificial mages should be being produced anymore, so how would they have been made? SOMEONE EXPLAIN IT TO ME PLEASE AND TELL ME HOW MUCH TIME HAS PASSED. 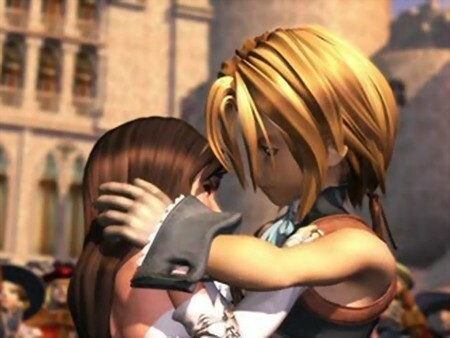 Moving thoroughly on from that can of worms, I have to close out Final Fantasy IX be reiterating just how much I love the pairing of Zidane and Garnet. There’s no funny love triangle. The romance isn’t forced. They learn from each other, they help each other grow and learn about themselves, and they get their happy ending. Call me a sap if you want, but their reunion in the end cinematic is such a blissful moment both for them, and for the player. Hands down, they are my favorite Final Fantasy couple. Speaking of favorites, I had an incredibly difficult time picking between Final Fantasy VII and Final Fantasy IX for the top spot overall, and the latter just barely wedged out the former. FFVII is still my personal favorite, but I believe FFIX is the overall more quality game. I’m not going into further details because my word count would rapidly double. Just know that they are both excellent, and it will be very tough indeed for any of the five remaining games to boot their way to the front of the pack. Notable series firsts: First game with item synthesis. I bought pretty heavily into much of the hype surrounding Final Fantasy X when it first came out. It was the first title in the series on the PlayStation 2, the first one with voice acting, and by far the best looking one yet. Then I got my hands on it, made my way through about ten hours, and gave it up out of frustration. I enjoyed the characters, and the plot was interesting enough, but the traditional leveling system had been replaced with the completely new Sphere Grid, and I was not a fan at all. If you’ll recall, the last time a game in this marathon deviated from the tried and tested level-up system, I really, really didn’t enjoy it. Having said that, I wanted to go into this replay with a fresh outlook, and not begrudge it for past frustrations. Plenty of other games have since featured skill trees similar to the Sphere Grid that I have enjoyed just fine, so I’ve been hoping the to come back to it with more understanding and appreciation for it. I am thankful to say that this is definitely the case. I can still see myself getting a bit annoyed with some aspects of the grid later in the game, but it’s not nearly as frustrating as I found it to be in 2002. I still prefer the traditional gain-experience-to-level-up system, but I’m progressing perfectly well at the moment with the Sphere Grid. Another aspect that I don’t have fond memories of is the summoning. Coming straight from Final Fantasy VIII when I last played FFX, I was used to the Guardian Force system, and FFX’s aeons seemed like another take on that. But instead of just taking the brunt of oncoming attacks until its special ability was unleashed, Final Fantasy X’s aeons take the place of your players in battle until they die, you recall them, or you win the fight. They’re kind of like Pokémon, honestly. You can use magic attacks that fit with its elemental strengths (i.e. Ifrit can use Fire spells), and unleash their special attacks when their Overdrive (limit break) gauges fill. Yeah, they’ve got Overdrives just like the main characters. It’s really quite neat, and I can’t fathom why I was so non-receptive of it on my first go. To wrap up my unexpected praise of the battle system, it is so helpful to have access to every member of your party during battle. You may be limited to three fighters in the ring at a time, but you can tag out for back-up member if you start to struggle or know one of your reserves has a super effective move learned that can help you out of a tight spot. Honestly, Final Fantasy X’s battle system is incredibly innovative compared to past games, and I can’t help but be impressed with it. Now since I’m playing the HD Remaster of Final Fantasy X, of course I have to touch on the graphics. As should be expected with HD polish, the game looks really nice. Especially satisfying is being able to utilize the entirety of my television’s screen to play the game; a first since I started this silly marathon. 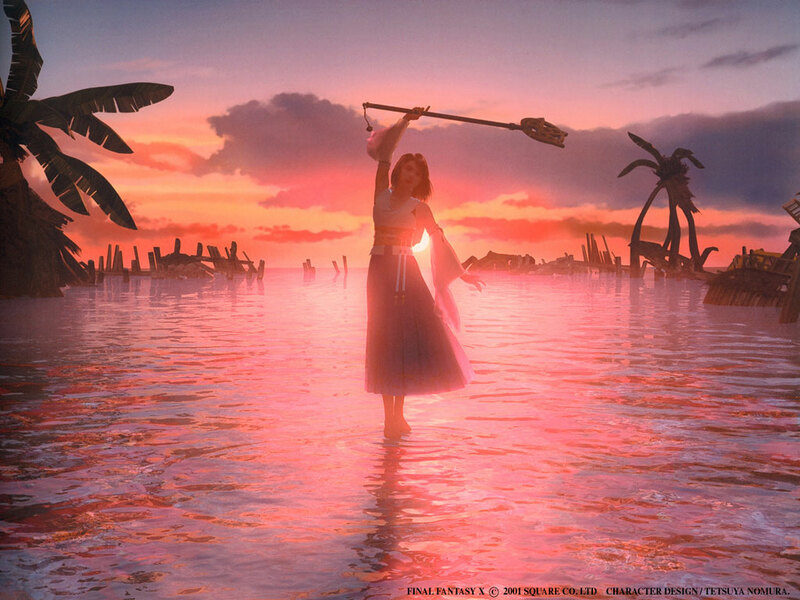 The cinematic sequences, such as Sin’s attack at the beginning and Yuna’s summoner dance in Kilika, are gorgeous, stunning, breathtaking. They really stand out, as they well should. However, this doesn’t reflect on the entire game. 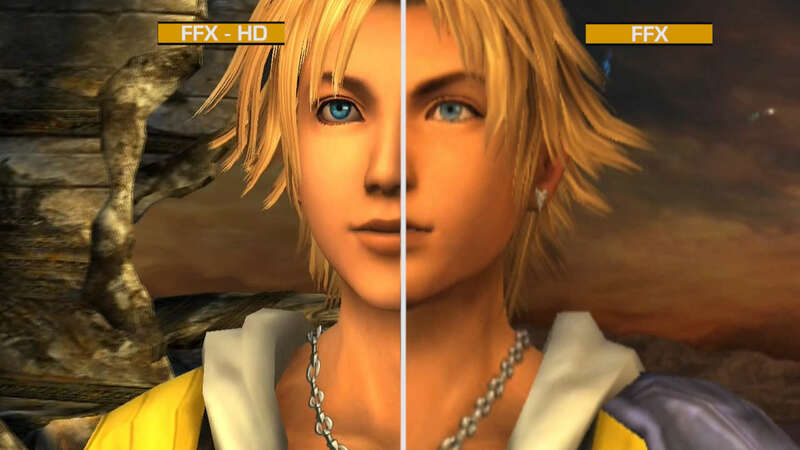 It’s obvious that the flagship entry on the PlayStation 2 looked leagues better than its PS1 predecessors, but unfortunately Final Fantasy X HD suffers the exact same problems that plague Final Fantasy Type-0 HD and Kingdom Hearts HD. The main characters have been touched up significantly during gameplay – smoother edges, more detailed hair, and so on. However, there as many non-player characters littering the world who look, uh, lackluster by comparison, to say the least. Their faces are flat, their movements are stiff and jagged, and they generally look like animated cardboard boxes. Just like Final Fantasy VII, this was the first game on new tech, and there were still kinks to pound out. Also just like FFVII, the models looks spectacular fourteen years ago, but they’re pretty obviously dated now. That’s all well and good, but the part that really bums me out about the graphics are that everybody suffers from the dreaded “flappy mouth syndrome”. Much like Kingdom Hearts, which originally released less than a year after Final Fantasy X, scenes where the characters are speaking to each other (which is nearly every scene) jump back and forth between fluid, properly matched mouth movements and awkward, bad-anime-dub mouth flapping. For a game that generally looks so great otherwise, watching the mouths just gab up and down is a bit jarring and lame. At any rate, I’m honestly quite enjoying Final Fantasy X so far. I’ve just played my first game of Blitzball, which I will discuss another time, and I’ve been reunited with the best character in the game: Auron. Maybe next time I’ll touch more on some individual characters, but I reckon 1900 words is more than enough for this week. Remember to catch me on Twitter @zacharyplyons, and follow my continuing Final Fantasy journey at the hashtag #RoadtoXVin15. Catch more thoughts on Final Fantasy X next week!